AIDS treatments continues to evolve. Now, so does the definitive reference on this complex and challenging subject! 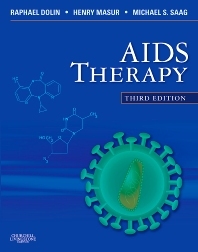 "AIDS Therapy, 3rd Edition" not only brings you comprehensive guidance on the latest treatments for HIV/AIDS and the full range of related disorders and syndromes, but also comes with access to updates online—so you can always tap into the most current therapy guidelines. Written by a "who's who" of leading global experts, the new edition of this classic reference is a must for any clinician who manages patients with HIV/AIDS. The most comprehensive coverage available on AIDS treatment equips you to meet any clinical challenge. Contributions from a large cast of noted international authorities put global "best practices" at your fingertips. Advice from some of the most respected experts in the field helps you manage your patients confidently. 9. Lamivudine, James H. Willig, Joseph J. Eron, Jr.
49. Varicella-Zoster Virus Infections, John W. Gnann, Jr.